I had originally said I wouldn't add the crochet. But I wanted to keep it authentic. This bench comes from a period where hand tool work was a high art. If they thought it was an essential appliance, then I wanted to give it a try. My solution was to add a removable crochet. This wouldn't be as solid as a fixed crochet, but would allow me flexibility. 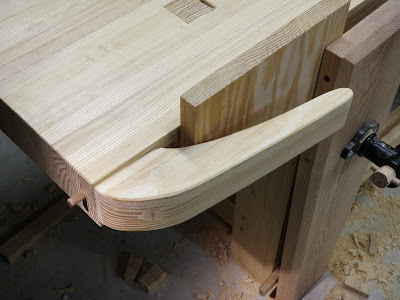 I had a cutoff from the glued-up stretchers just the right size. I formed the curves the same way as the sliding deadman. 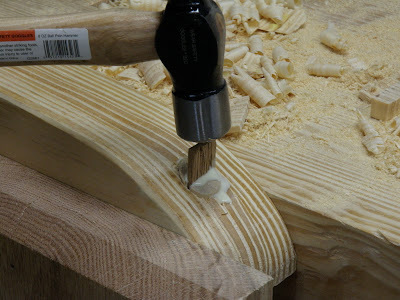 I found the surform rasp a little better to use on the concavity. The surform plane worked well on the convex curve. Gotta chamfer all the edges! Boring the hole for the post. Since the post will be fixed to the crochet for insertion into the top, this needs to be a continuous straight line for a good fit. Trimming the post after bottoming it in the hole. In order to get a good solid attachment to the crochet, I sawed a kerf down the post and drove in a wedge. The wedge needs to be aligned perpendicular to the grain to avoid splitting the crochet as I drive it in. 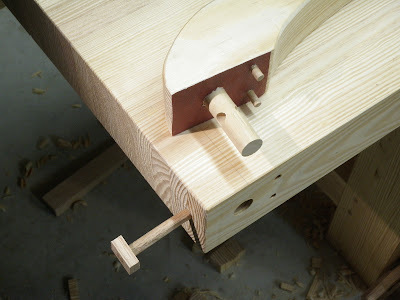 After cleaning up the end of the wedged post, I bored a cross-pin hole through the end of the bench and the post. Then I inserted a removable pin. This locks the post in place. The crochet moved out a bit as I bored the hole, leaving a small gap, so I added a layer of PSA sandpaper as a shim. That makes it draw up tight against the top when the pin is inserted. Under pressure from a workpiece, the crochet had too much give, so I drilled two small holes for alignment pins. The crochet removed. You can see the sandpaper shim layer, the main post and alignment pins, and the withdrawn locking pin. I glued a square nut onto the end of the pin for easy handling and trimmed it off flush. The alignment pins made a big difference in stiffness. Still not as solid as a couple of lag bolts, but it holds quite well. We'll see how it stands up over extended use. Speaking of shims, I had another brainstorm. 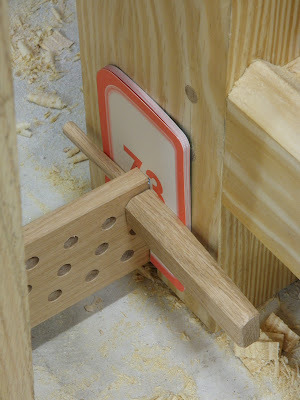 The indexing holes in the leg vise parallel guide are spaced about 3/8" apart. 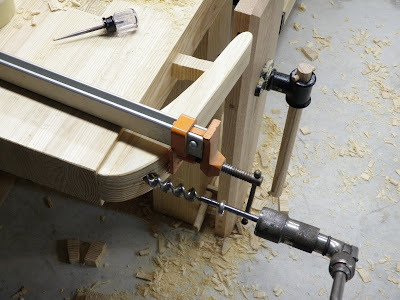 When something in between those points is in the vise, it suffers the same racking as a parallel clamp where the two screws are not set equally. So I bought a deck of large flash cards at the toy stored and made a set of shims to allow fine spacing. 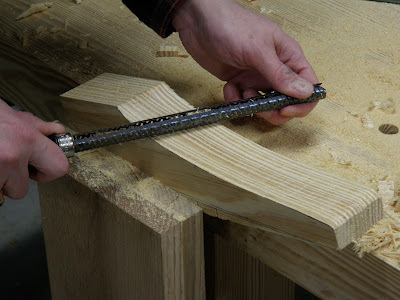 This in turn allows fine parallel adjustment of the leg vise for maximum grip. Just like a parallel clamp standing on end. A stack of 10 of these cards measures out at 0.14" with a dial caliper, so they average 0.014" each. Finally! 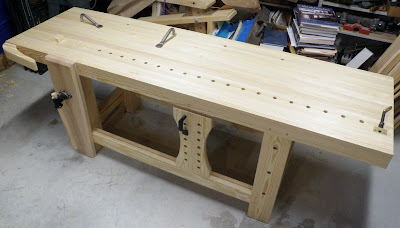 The completed bench, with leg vise, planing stop, crochet, deadman, Wonder dog, and holdfasts. I kept a log of all the time I spent on the bench. Spread over 20 calendar weeks, it totaled 88 hours and 26 minutes. There was probably a good hour or so spent fiddling with the camera, so call it 87 hours. And now a final treat. I made a video demonstrating the features of the bench. It's in two parts due to YouTube limitations on length. NOTE: I have seen problems with these showing up with Firefox on Ubuntu Linux, so if you don't see them below, search for them on YouTube with by clicking here. Wow you must be really happy about finishing and using your new bench! I really like the removable crochet idea, I've never seen that before but it looks like a really great idea. Thanks for documenting your build. Thanks! Yes, I'm very happy with the result. Now I need to build something for outside the shop. My first project will be an Arts & Crafts style side table for the living room love seat. My wife keeps threatening to buy one. She's heard "I can build one!" for too many years, but now I can actually follow through. Steve...You've got a wonderful bench that has a tremendous amount of versatility. It's inspiring to see it come together and surely you'll enjoy it for a long, long time. Let me join the others that appreciate your documentation. Hopefully, you'll be sharing some of your future projects as well so we can continue to witness the value of a great workbench. Now that you've used it for a while, how do you like the crochet? Well...I'm glad I made it removable! As you can see in the posts on applewood, I removed it so I could rip the logs. As I told someone else, the bench just has so many ways to hold work that it's hard to take advantage of them all. I fully expect there will be some operation at some point where I'll want to put it back on; it seems like one of those things you're really glad to have when you need it. Very nice bench, I've really enjoyed reading through this entire series! I have to start mine soon. Being at the age where I'll be struggling with some of the heavier handwork, I hope you'll excuse me if I use machines here and there. I don't know why I am bothering though, as it's a safe bet my Son will get more use out of it than me. Unless he sells it on! Still, I have this stack of SYP and Douglas Fir, acclimatising in my shop, and the moisture meter tells me it's almost time to start. Wish me luck! Nothing wrong with using machines, it's all a matter of your personal goals. While my goal was to do it all by hand, I did use the power planer for dressing all the lumber. That was just a lot of repetitive grunt work, a perfect task for a machine. Set the machine for thickness and run 20 pieces of lumber through, repeating until desired surface is achieved. 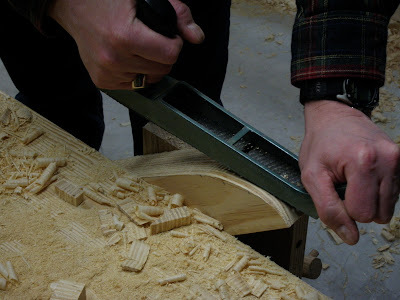 Plus, at the time my sharpening and planing skills were not as good as they are now, nearly a year later. I would still be at it if I hand-surfaced all those boards! 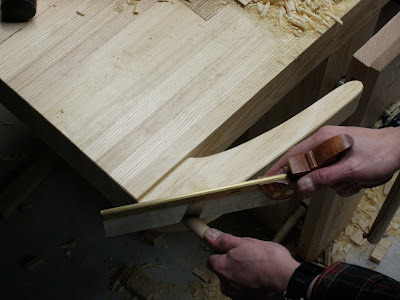 I am only a few months into my interests in woodworking and I stumbled on your blog. 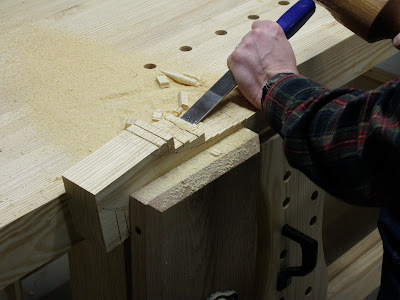 It is an incredible resource and I have learned so much just by reading your documentation of building your beautiful bench and the videos on utube. I am so excited to begin to explore and learn about woodworking! Thanks for the inspiration! Thanks, I'm glad you find it helpful! You'll find it's great fun, very satisfying. It's occasionally frustrating, so don't get bogged down when that happens, just treat it as a learning experience. I just read the whole series of these and I just finished reading both the 2007 and 2011 workbench books from The Schwarz. I am in l love with this design and will build my bench exactly like yours. 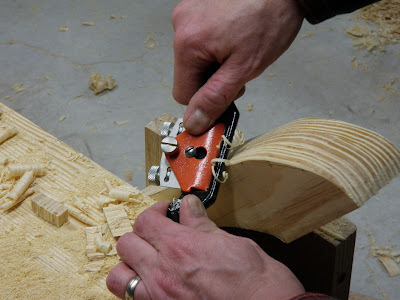 I think that the face vise design you used is exactly what I'll need, and I'll be taking the Schwarz's Veritas bench-dog ideas instead of a tail-vies. Lovely lovely bench and nice craftsmanship. Well done, you. Incidentally I am also a software engineer and just getting into the wood thing.